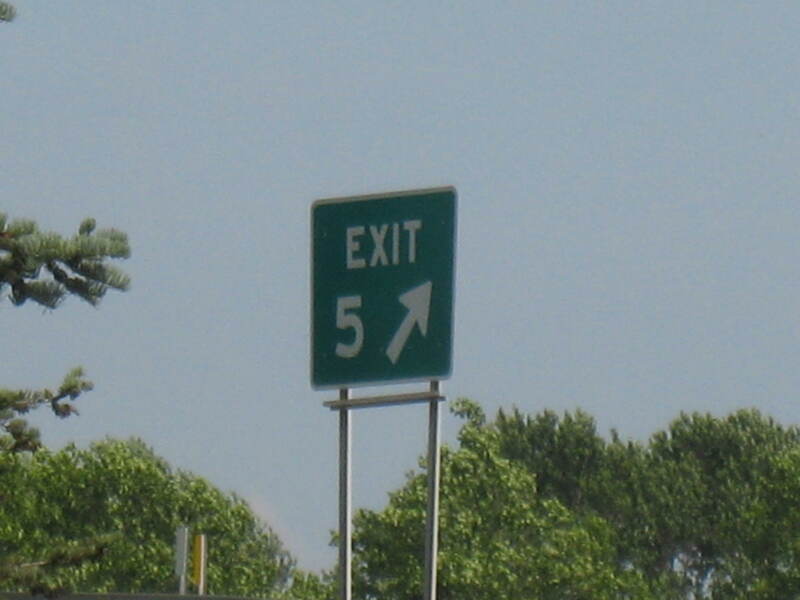 When I saw the sign “Cutler Garden 0.5 à” on exiting Rte 81 Friday night, I didn’t think much about it. It was only after I realized we had free time Saturday afternoon that the sign floated back into my conscious mind and I asked my husband Mike if he wanted to go with me to find “Cutler Garden.” Thinking it was likely a garden center, I was surprised and charmed by my first glimpse of the garden. You can see the exit sign from the garden. 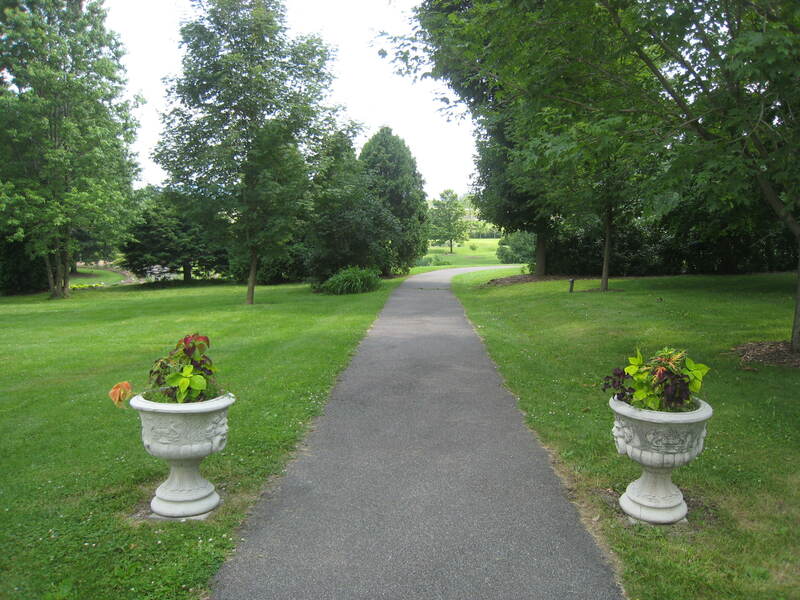 Situated in a hollowed-out section of land hard by Exit 5 off Route 81, the botanic garden is actually a series of gardens charmingly strung together to create vistas and views as well as show visitors what grows well in northern NY State. 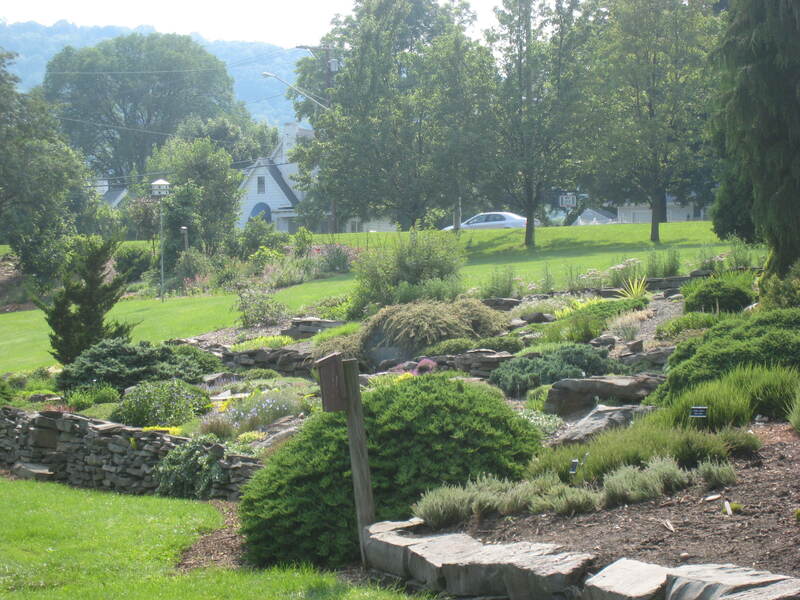 From looking at a brochure I found near the entrance to the garden I figure that the Cornell Cooperative Extension must have created the garden, which is well maintained by local master gardeners. With the muted roar of Route 81 traffic as a visual and auditory backdrop the garden is surprisingly contemplative and calming. As we followed the pathway through the different display gardens traffic and noise faded to nothingness. We heard the birds – only the birds – as we walked. My Dad used to call these dead tree trunks "snags." 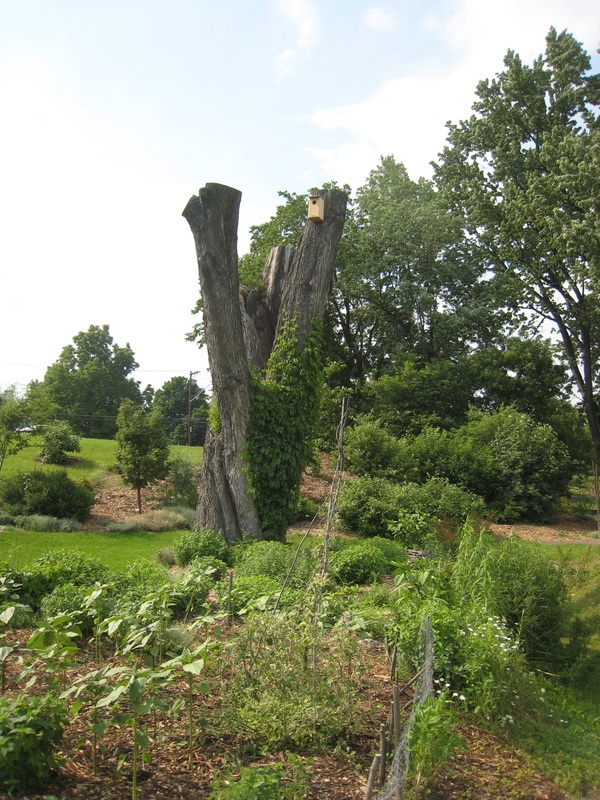 The first garden, the wild bird demonstration garden, recreated a hedgerow, used by many species of birds for nesting, as well as showcased flowers and shrubs that nurture caterpillars, insects and the birds who eat them. Included in this area was a dead but still standing tree trunk clearly used by woodpeckers seeking insects and small animals seeking shelter. 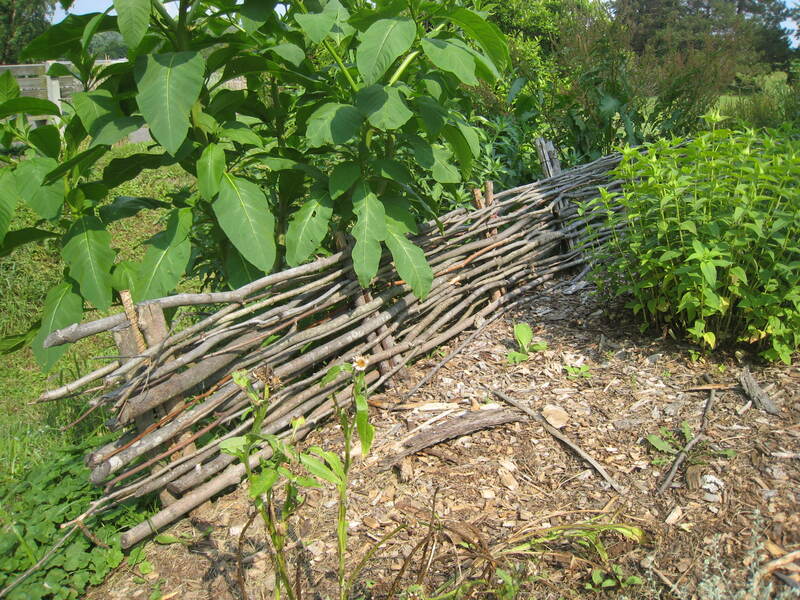 A cleverly woven wattle fence completed the picture. I wonder if the master gardeners offer "how to" classes. Rounding a bend in the path we saw a large lawn area, then the first fenced-in garden. Intrigued we opened an old-fashioned gate and walked into a traditional vegetable garden. Raised beds fashioned from a variety of materials were planted with different varieties of peppers, tomatoes and more. 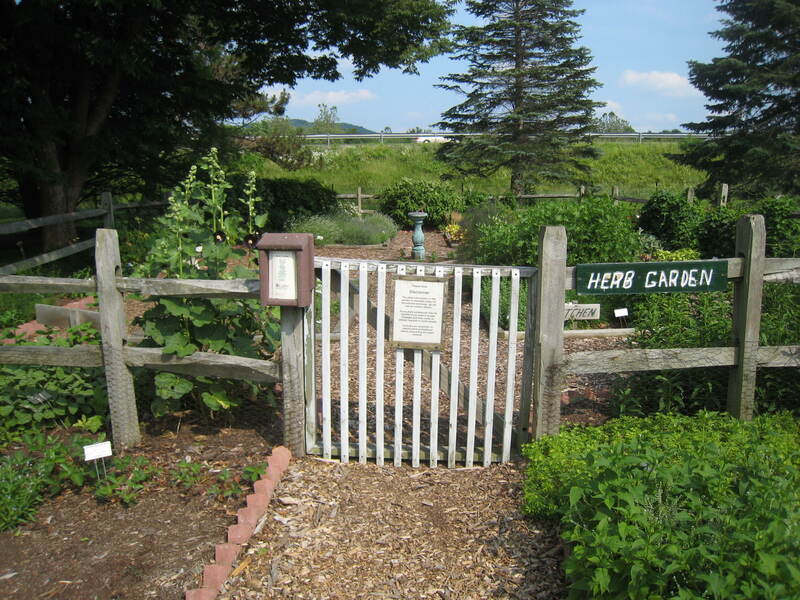 Clearly, the master gardeners wanted to show us that many different materials can be used to create garden beds and that many different vegetable varieties thrive in this area of NY State. The grass display garden, a large oval bed, was stuffed with artfully arranged grasses. Mixing tall with short and heights in between, the bed showcased the many sinensis varieties that thrive in this area of NY. 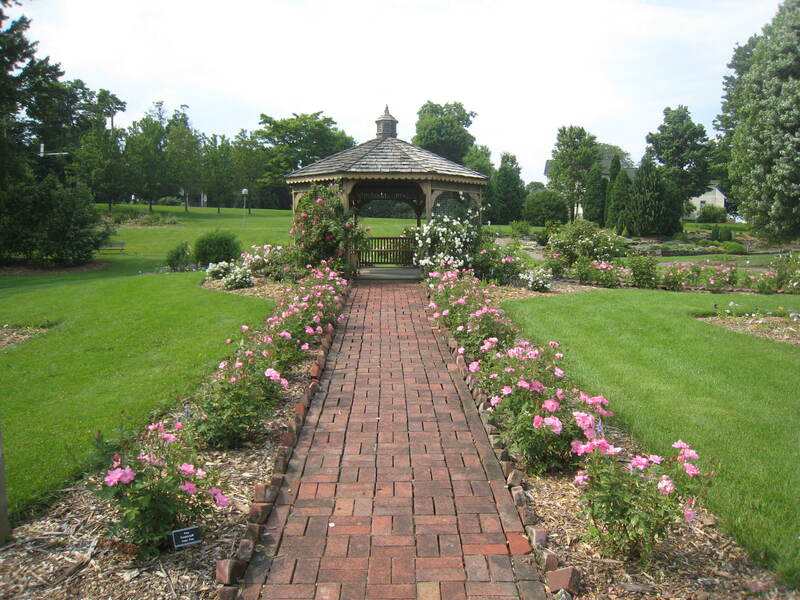 The gazebo garden was a perfect backdrop for traditional wedding photos with its carefully maintained rows of pink and white roses leading up to and surrounding the gazebo. My photo doesn't do the roses justice. Walking on we saw the Rose Walk, an explosion of roses in full bloom situated along a winding path. Then the evergreen garden popped into view. Although I was amused by the few topiary pruned shrubs, I much preferred the traditionally shaped blue spruce with its classic beauty. Near and dear to my heart was the herb garden. Laid out in a traditional style, we walked through the gate and browsed the different themed gardens – culinary, Shakespeare, medicinal and more, all showcasing herbs. We walked around the botanic garden for a while, looking at the carefully labeled plants and marveling at the quality of care lavished on them. Truly, Cornell Cooperative Extension has a botanic garden that’s artfully designed, well maintained, and well worth a visit. If you have any free time and you’re in the area, stop by and take a look. I don’t think you’ll be disappointed. The undulating hillside was aglow with color and texture.